�����Over the last ten years the coin market had been defined by its depth, there were more buyers than sellers and multiple rare coins of the same date and grade could be traded at any given coin show at a price that was within a close range of the then current FMV. Then there were the exceptions; coins that had tremendous eye appeal for the grade, possibly a CAC or + graded coin, that would attract a premium, or coins that were so rare that they had been off the market for some time and presented the potential buyer with a once in a lifetime chance at owning history. But the market has constricted over the last year and a half with more buyers looking for lower premium coins, include bullion, where there are opportunities for value to increase from the metal content of the coin rather than its potential rarity. �����With the decrease in demand for collector coins that we have seen in the coin market this year, many coins of the same date and grade are trading at big spreads. For example, at any major auction, where the number of potential buyers is unknown to the public until the coin is actually up for bid, and there are multiple coins of the same date and grade, the strongest buyer will typically purchase the coin that has the greatest eye appeal. Once this bidder is out of the equation, the other bidders may be willing to pay substantially less for the similar coins. We can find examples of these big spreads by looking at the latest Long Beach Auction hosted by Heritage Auctions. �����There were no less than six 1891 Morgan Dollars in this most recent Long Beach Auction, all graded MS64 by PCGS. The prices realized for these six coins ranged from $400 to $1,645 (there were actually two that sold for $1,645). The NumisMedia FMV for this date and grade is $730, NGC values it at $850 and PCGS shows $775. With over 3,000 coins listed in the population reports combined for PCGS and NGC, there are plenty of these available in today�s market. It would seem that the buyers of the two coins that sold for $1,645 believe they will eventually upgrade to either a + or even MS65; however, of the other four coins, three of them sold for $400 to $541, looking like bargain prices. �����The FMV for the 1891 Morgan Dollar in MS65 has fallen from $8,060 in 2010 to the current $4,470, down about 45%. This drop is due mostly to the current state of the coin market; there is not as much demand for this particular coin and there has been an increase in the number of coins available, per population reports. 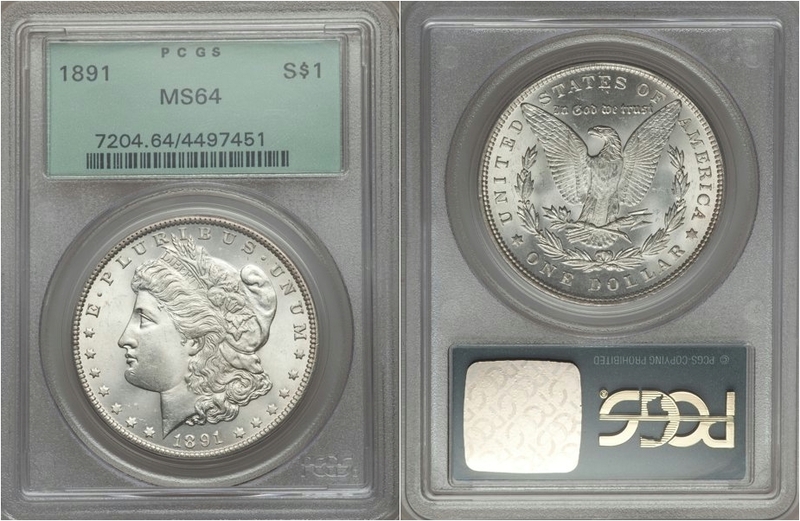 However, the fact that the two 1891 MS64 coins that brought $1,645 in the auction have the potential of upgrading to MS65 and thus having a possible FMV of $4,470 each, could still make a hefty profit even in a weaker market. This is why it is extremely important to study the auctions to look for bargains, using your expertise in grading and knowing the tendencies of the grading services. This is how many dealers continue to thrive in a down market. �����Another example from the Heritage Auctions Sale at Long Beach, there were three 1890 O Morgan Dollars, all PCGS MS65�s, two sold for $1,116 and one for $1,058; one coin was bright, one had light peripheral toning, and the third coin had deep toning. All sold within a 10% range, more or less verifying a value that should be consistent with the overall market. So what should these coins be worth? �����In 2010 the FMV was $1,750 and rose to a high of $2,030 in 2014 when the Dollar market was hot. Using the Heritage auction archive the NumisMedia FMV is at $1,750, NGC lists the coin at $2,100, and PCGS says it has a retail value of $1,650. With this new information we have lowered the FMV to $1,660, but if you were one of the lucky buyers at this auction, you were able to purchase one of these 1890 O Morgan Dollars at a most reasonable price of no more than $1,116, which certainly appears to be a bargain at this price. �����While these examples have been limited to Morgan Dollars, there are bargains to be found in all series, especially those dated prior to the 1930�s. Studying the recent past history of any series will expose some wonderful opportunities for profiting in the future when the market cycle turns around. A good time frame to study would be 2013 to 2014 when the coin market was extremely active and the number of buyers was at an all-time high. �����As for Modern Dollars, the 1971 S Ike Dollar in Deep Cameo PR70 had an FMV of $11,250 at the beginning of 2010; today with a population of only 75 coins, all PCGS, the FMV is $2,160, down $9,090 in six years. A comparison of other price guides from the Heritage Auctions archive shows PCGS at $2,150 and NGC at a lofty $5,000. �����Keep in mind that just because a coin has lost some of its value as the market cycles downward does not necessarily mean it is a good value at the lower levels. Sometimes coins seek their true value and remain there for a long time. It is only when collectors perceive a long-term higher value because of grade, population, demand, eye appeal, or some other characteristics that help advance the FMV. �����It has been said by many; buy the coin not the holder. This is a great approach to buying the best coin for the money. 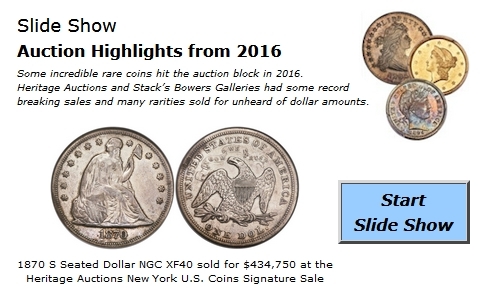 However, many dealers are in the market for purchasing the older holders of PCGS and NGC. Their thinking is that the coins certified in the older holders from the early years of certification were more strictly graded and many of them have a shot of being upgraded in today�s market. So when you see coins in old holders selling at a premium, this may be one of the many reasons for the premium. In some cases, coins have been known to upgrade by as many as two points.